Download PDF File here for some House Rules to implement these great markers in your game. We have heard our gaming customers asking for markers that are better than cardboard, but smaller than other companies that produce these. So here they are! Laser cut on brown acrylic, laser etched design, filled in with acrylic paint and heat cured. They are durable, bright, and easy to handle...1/8" (3mm) thick. 1/2" (13mm) square. HBG stands behind ALL their custom products! One of many HIGH quality, easily read markers of just the right size which add new dimensions to our gameplay in Global War 1936 OR 1939 games. Another excellent set of markers from HBG. Perfect for your Trans-Siberian railway! High quality product. 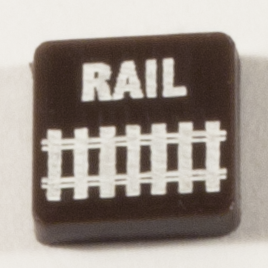 Used them for the Burma Railroad in A&A Global, adds to the game to see Japan cut off the supply lines and China fight their way back with these tiles providing an added visual attraction for the railroad. 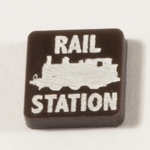 THESE ITEMS ARE A MUST FOR YOUR WARGAMES WHEN YOU HAVE THE RAIL STATIONS IN PLACE.. ..WHAT A GREAT ADDITION WHEN TRANSPORTING FIELD UNITS TO AND FROM BATTLES..A GREAT WAY TO WIN A WAR OR BATTLE BY GETTING YOUR UNITS TO THE FRONT LINES IN A HURRY..
A nice addition to the Rail Station Marker!